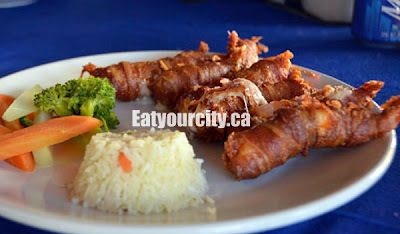 Eat Your City: The Shrimp Factory, Cabo San Lucas, Mexico - Awesome bacon wrapped cheese stuffed shrimp! The Shrimp Factory, Cabo San Lucas, Mexico - Awesome bacon wrapped cheese stuffed shrimp! Rating Overall Food 7.5/10, Service 7.5/10 Imperial shrimp 9.5/10! Tucked right along the main street around the marina, we find our way to this shrimp place after amazing shrimp in Puerto Vallarta at Blue Shrimp. 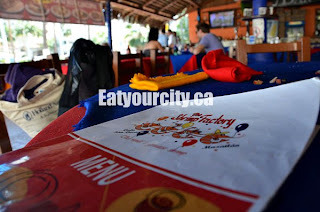 We did our tour of the famous arches, Lovers Beach and the ajoining Divorce Beach... with so much beach time, how is it I always work up a voracious appetite for shrimp? Maybe it was the long walk from the beach back to downtown. 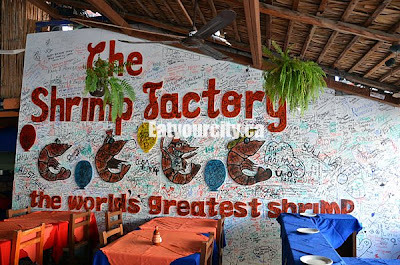 There were numerous jewllery vendors harassing us along the way, but we finally made it inside the Shrimp Factory. The staff were really friendly - and while waiting for a table, we even met a couple from Edmonton, small world! 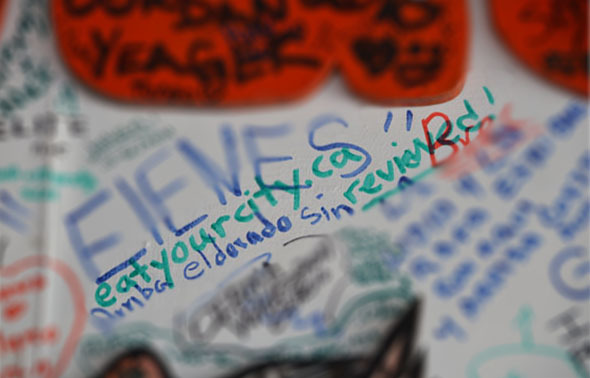 They had a huge comment board/wall simular to Giovanni's Shrimp trucks in Hawaii, so we left our mark! The resturant is open air with colorful tables and a interior reminescent of a thatch beach house...very cool and comfortable. Tahdah, now I've left our mark! See if you can find it the next time you're there! 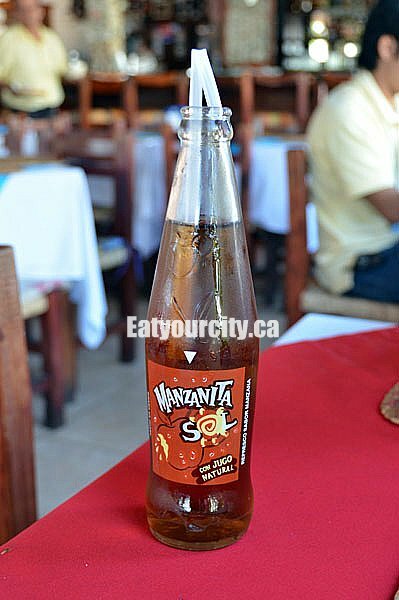 For the non-alcoholic drinks, we went with a round of Manzanita, a carbonated apple juice. It was quite sweet, but tastes like apple pop. Couldn't find the picture, so using picture from another bar we visited! 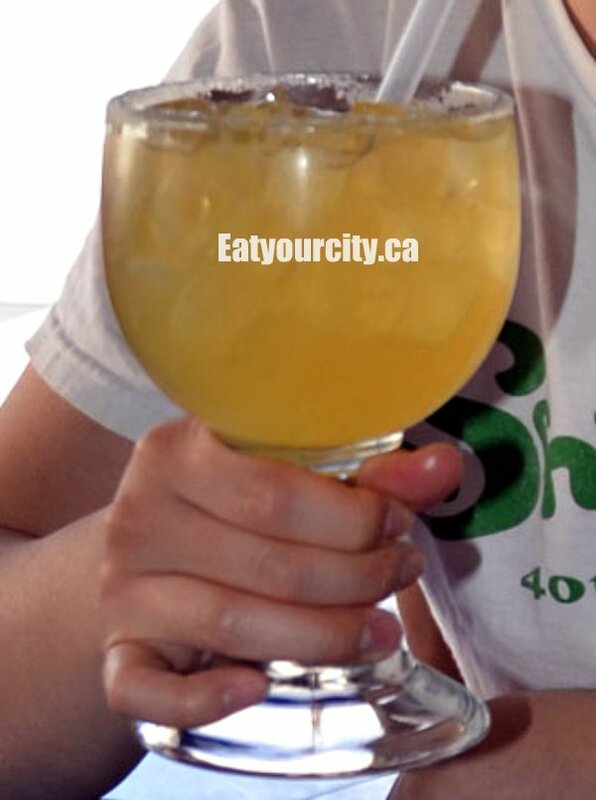 For happy drinks, we went with the Margarita Cadilac. 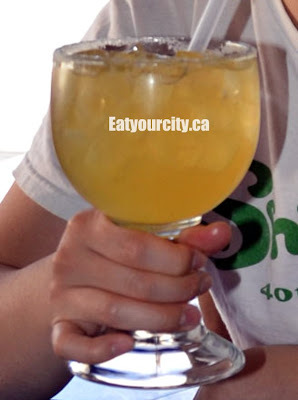 Brimming with multiple shots of Tequila Cuervo Gold, Grand Marnier and Damiana, it tasted of... well, straight alcohol! So powerful, it could probably be used to remove paint. Wooo! We started off with a platter of chips and salsa. These lightly fried tortilla chips along with a fresh mild chunky salsa full of onions, peppers and tomatos were soooo good, I had to come back for another platter the next day. Then came our dinner for two...HUGE! You get two butterfly shrimp, two coconut shrimp, a piece of mystery fish, one lobster tail, 2 beer battered shrimp, shrimp cocktail, and two bacon wrap and cheese stuffed jumbo shrimp. The platter was served with a chipotle based sauce and a coconut sauce that tasted like the coconut syrup I had at Eggs N Things in Hawaii a while back. 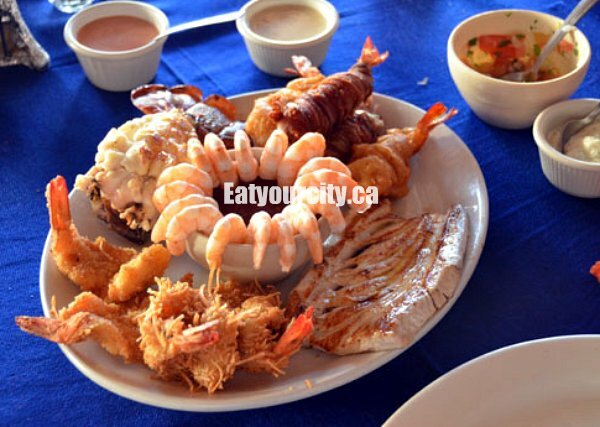 The coconut syrup is so delicious, super sweet, but really good with the battered shrimp! The battered shrimp and coconut shrimp were pretty good, not over cooked, but everything is better in jumbo form, especially with the sauce! The shrimp cocktail was average, as I like my cocktail sauces with much more horseradish. The lobster tail was grilled to perfection, really juicy and tasty. The grilled fish (tuna?) was the only downer as it was really really over cooked and dry. After only a few of the Imperial jumbo shrimp, we had to have MORE! Wrapped with bacon and stuffed with cheese, then deep fried to a crisp. Let me repeat that: bacon wrapped shrimp stuffed with cheese. Heaven on a plate!! I think my brain is still stuck on the awesomeness of the Imperial Shrimp. 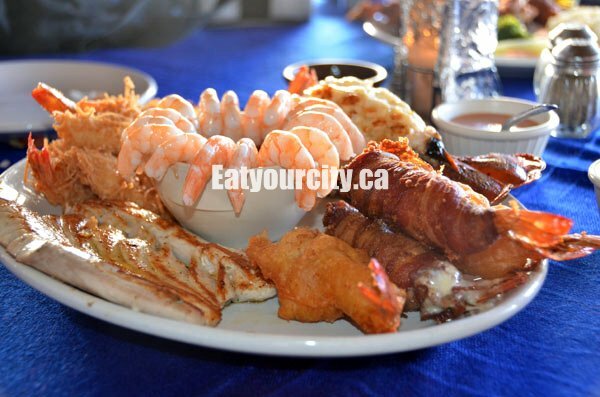 How can you go wrong with crispy smokey bacon, succulent shrimp and gooey melted cheese? Stuff yourself with bacon wrapped cheese stuffed shrimp and you won't regret it!